The very first Hong Kong Institute of Architects (HKIA) Cross-strait Architectural Design Symposium & Awards 2013 ceremony, held last Saturday night in Hong Kong saw Andrew Bromberg at aedas winning the Silver Award, the highest honor under Shopping Centre category among over 300 submissions this year. Located outside of Guangzhou, on Pazhou Island within the Pearl River and completed in September last year, the winning project Guangzhou Commercial Showcase Complex (Site 1301) features a large retail exhibition area in the podium and a large office showroom building on the top. 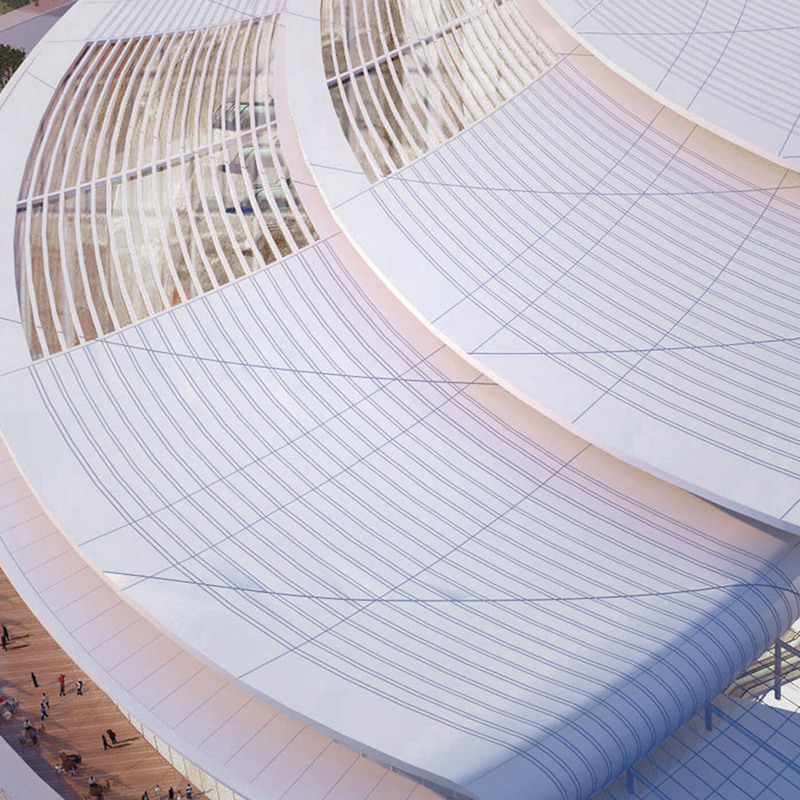 Together with Site 1401, which contains a traditional multi-floor exhibition centre in the podium and a 500-key five-star hotel above, the whole development forms the design of the Nanfung Commercial Hospitality and Exhibition Complex, a mixed-use development which responds to its surrounding area as well as the separation of the project’s two individual sites. Understanding that the entire development, which is actually fragmented in comparison to its surrounding dominant neighbours, led to a design approach which is simple yet dynamic allowing a cohesive presence on the major street wall to the north. This enables the two separated sites of the mixed-use complex to have a strong identity in order to stand out next to some very strong formal neighbours.